Is this new pickup system taking the mic? A quick and simple solution for amplified solo performance. Mic captures organic sounds well. One of IK’s particularly finely-honed talents is spotting a gap in the market and coming up with a guitar product to fill it - and it’s often one that makes recording and performing easier for us players. 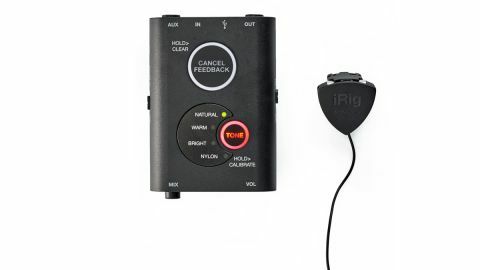 The iRig Acoustic Stage follows on from 2015’s mic-only model by adding a battery-powered DSP preamp. The idea is that you fit the plectrum-shaped MEMS mic to your guitar’s soundhole and then into the preamp that provides EQ presets for standard acoustic and nylon-string (we liked Bright best). You can then connect to a recording device via a USB, into a PA via jack or even combine signals with your guitars existing piezo by using a separate auxiliary input from your guitar and the mix control. Nice. The little mic captures the organic natural sound of our dreadnought well and it’s easy to fit to a guitar you’ve never been able to use live before. The caveats are the mic cable seems flimsy and the output is low and so no match for an active onboard preamp with a piezo so you’ll need to boost it to hit performance and decent recording levels. Any feedback we experienced when we turned up our acoustic combo was easily dealt with by the multi-frequency-enabled ‘cancel feedback’ button. The Acoustic Stage has been positioned in a middle ground: it’s understandably neither as detailed as using a condenser mic or as powerful as active soundhole or piezo systems. But for recording that also means it won’t pick up as much unwanted noise. For a quick and simple solution for amplified solo performance there’s nothing else quite like it on the market.